Join Us at the Second Annual So All May Eat Gala! Come join this gathering of local chefs and people who are passionate about the belief that everyone deserves access to healthy food, regardless of ability to pay. SAME Café exists to create community through healthy, locally-sourced, mostly organic meals that are provided to every person who walks through the door. We have no prices on our meals and people contribute to our community in exchange for a meal: either through volunteering time, donating produce, or paying what they can. SAME Café is about community, dignity, and healthy food. During this event, we will also launch the SAME Café Food Truck! A percentage of our tickets are available at a pay-what-you-can price or to volunteer in exchange for a ticket! To learn more, please message info@soallmayeat.org. This year’s So All May Eat Gala will be held at the McNichols Civic Center Building 144 West Colfax Avenue, Denver, CO 80202. Tickets may be purchased through Eventbrite. We are extremely grateful to the Colorado Health Foundation for their $50,000 grant this month for the SAME Café Food Truck! The Food Truck will extend the reach of the SAME Café to serve nutritious, high-quality food to people throughout the Denver area. Like the Cafe, the SAME Cafe Food Truck will operate as a pay-what-you-can-afford for the freshly-prepared meals from the mobile cafe and easy-to-cook produce from the mobile food market in the food truck. With generous contributions of $15,000 from the The Buck Family Foundation, $10,000 from Kathryn and Gary Dudley, $5,000 from the COBiz Cares Foundation, $5,000 Nancy Grandys-Jones, $5,000 from Timothy Pfiefer, $1,000 from Joe Woodward, and donations from many other SAME Cafe friends we are just $11,000 from the total we need to be able to purchase, equip and operate the Food Truck during 2019! You can help this exciting new SAME program feed hungry people in Denver by donating at coloradogives.org/SAMEfoodtruck. We are having a birthday party in the celebration of SAME Cafe’s 12th birthday! It is taking place at SAME on October 20th from 5 to 8pm. It is free and open for anyone to attend. Please come and celebrate 12 amazing years of SAME Cafe with us. Come Join Us At The So All May Eat Gala! 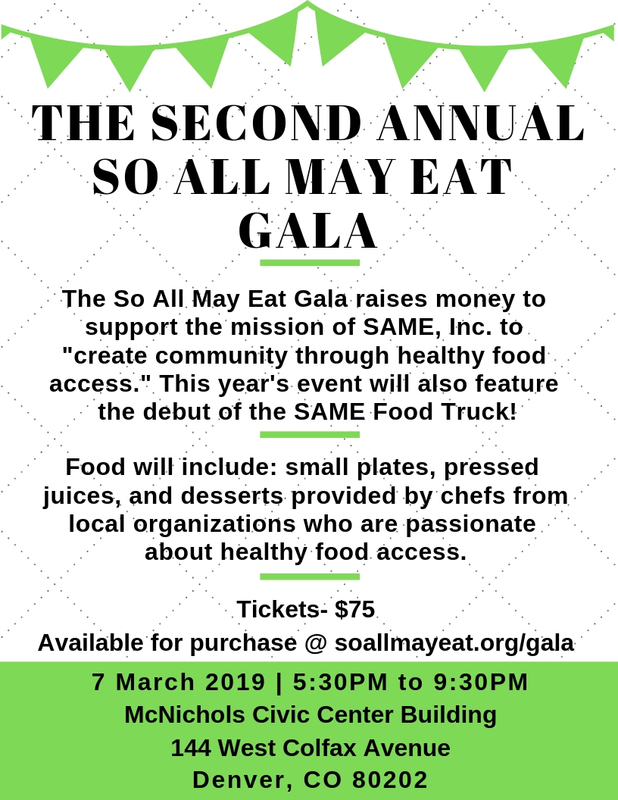 The So All May Eat Gala will raise money to support the mission of So All May Eat, Inc (SAME Café) to “create community through healthy food access.” This is the first annual So All May Eat Gala and will be marketed to the stakeholders of SAME Café in Denver, which includes over 1200 volunteers, a donor base of over 1500, and a mailing list of over 1700 people. The goal is to have 150-200 people participate in the event, which will include a powerful presentation about healthy food access and hunger, small plates from 5 local chefs, and auction items.